Movie: "The Sword in the Stone"
A wizard named Merlin (Karl Swenson) helps educate a young orphan named Arthur (Rickie Sorensen) and guides him to realize his true destiny. Disney tells their version of the T.H. 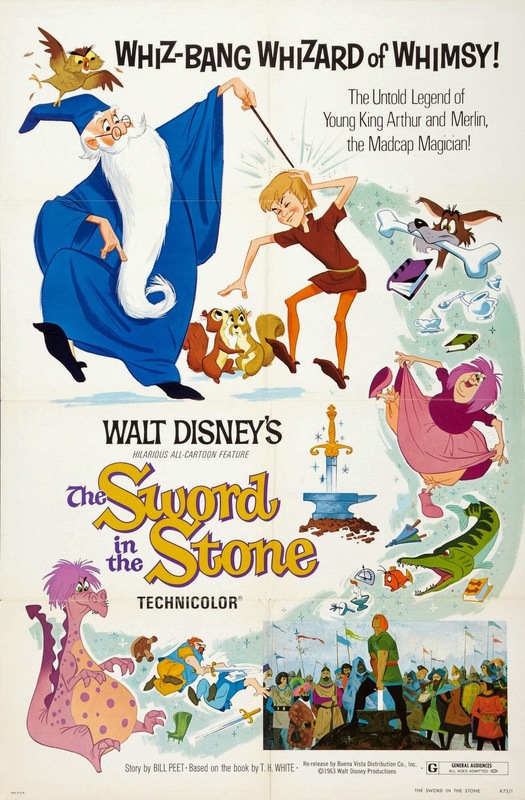 White novel "The Sword in the Stone" in this 1963 animated feature, which has always been one of BigJ's favorites, but not really one of mine. They tell the tale King Arthur, voiced by Rickie Sorensen, as a young orphan boy who has been given the nickname Wart by his guardian Sir Ector, voiced by Sebastian Cabet. Wart seems to have small hopes in life and his biggest aspiration is to be the squire of his guardian's son Kale, voiced by Norman Alden. But Wart's life changes when he meets a wizard named Merlin, voiced by Karl Swenson, and his smug and snarky yet intelligent talking owl Archimedes, voiced by Junius Matthews. Merlin knows Wart is destined for big things as he can see into the future, but he's a little absent-minded to say the least, so he's not exactly sure what that destiny is specifically. Merlin teaches Wart the importance of a good education, which is always a great message to push towards children, as well as the importance of brains over brawn, even in the dark ages, which was a time where so much was decided by hand-to-hand combat. Merlin accomplishes this teaching by letting Wart experience life as many different animals, including a fish, a squirrel, and a bird. These scenes are all great fun and lead to some exciting, sometimes funny yet sometimes dangerous situations. The main climatic scene in the teaching of these lessons is a showdown between Merlin and a witch named Mad Madam Mim, voiced by Martha Wintworth, who have a wizards duel where they change into a series of animals to defeat one another. This is one of BigJ's favorite scenes. This take on the classic story is on kids will love even today, and one adults who grew up with it will remember fondly. There is, of course, some great music in the film, and though they are fun, the songs aren't quite as memorable as those from other Disney films of the same era. The era we refer to runs from about 1951 with "Alice in Wonderland" all the way to 1973 with "Robin Hood." All the films that run through this time frame have a similar animation style and feel, and while watching "The Sword in the Stone," it dawned on me that this style was getting pretty tiresome. Though not the greatest Disney animated feature, it is certainly a good, entertaining picture and one at least BigJ will always have fond memories of. One year ago, we were watching: "About Last Night"